You are on Assisted Travel Contact Information. Skip to the next section. The car park is located opposite the booking office and platform 1. There is/are 3 Blue Badge parking bay(s) within the car park. The dimensions of the Blue Badge parking bay(s) are 330cm x 490cm (10ft 10in x 16ft 1in). The nearest Blue Badge bay is 8m (8yd 2ft) from the car park platform 1 entrance. The furthest Blue Badge bay is 22m (24yd 2in) from the car park platform 1 entrance. The drop off point is located to the left of the car park, just before the ticket office and platform 1 entrance. You are on Outside Access (Ticket Office Entrance). Skip to the next section. You are on Level Change (Ticket Office Entrance). Skip to the next section. You are on Outside Access (Station Road Platform 1 Entrance). Skip to the next section. This information is for the entrance located next to the ticket office. The width of the door opening is 230cm (7ft 7in). You are on Level Change (Station Road Platform 1 Entrance). Skip to the next section. You are on Outside Access (Car Park Platform 1 Entrance). Skip to the next section. You are on Outside Access (Rosebank Avenue Platform 2 Entrance). Skip to the next section. This information is for the entrance located on Rosebank Avenue. You are on Level Change (Rosebank Avenue Platform 2 Entrance). Skip to the next section. The desk/counter is 8m (8yd 2ft) from the ticket office entrance. The ticket desk is height adjustable to allow all users easy access. There is seating available with armrests in the ticket office. You are on Train Station. Skip to the next section. There are generally 1 member(s) of staff on duty. There is not an office to obtain help. The station is not staffed between 20.30 - 06.10. There is a ticket office. The ticket office is located to the left of the car park. The ticket office is 4m (4yd 1ft) from the Station Road platform 1 entrance. The train companies that operate within this station include:. Please click here for access information for ScotRail. There is not a taxi rank at the station. There are 2 platform(s) in the station. The platform(s) which has/have level access is / are 1. 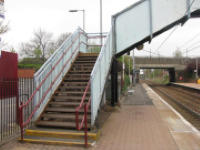 The platform(s) accessed by ramp / slope is / are 1-2. 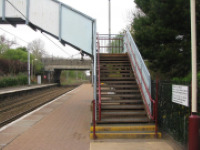 The platform(s) which can be accessed by either level access / ramps / lifts / stairclimber from inside the station is / are 1-2. 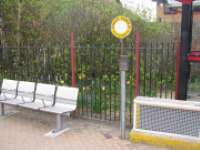 The platform(s) which can be accessed by using alternative outside access entrances only is / are 1-2. Announcements on platforms are audio and visual. Platforms which have tactile markings at the platform edge are 1-2. Accessible toilets are not located on the platform(s). Accessible toilets are not located on the main station concourse. There is not a wheelchair available to borrow. Assistance can only be provided if it is booked in advance via the helpline. 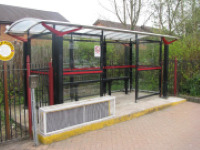 There is sheltered seating on platform 2 accessed via a deep step without handrails. You are on Level Change (Footbridge). Skip to the next section. 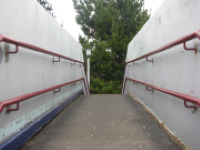 The ramp/slope is located on the footbridge. The step(s) is/are located on platforms 1 and 2. The assistance dog toilet area is located in the car park.